All questions were submitted via email while I was doing research in Antarctica on B-15. What is the size and location of the icebergs? What else do you know about them? The icebergs are floating somewhere near Antarctic, although the name of the place might not mean anything to you. We know they are travelling at a high enough speed to destroy about fifty miles of any coast they strike. Why is it called B-15? It sounded professional, scientific and slightly frightening. We estimated that it will have the impact of approximatley 7 and 1/2 B-2 bombers dropping explosives when it does hit land. Please tell me what are the estimated dimensions of the enormous iceberg? The measurements from satellite are ~3000 km by ~370 km or around 1,800 mi by 220 mi. What's the life expectancy of B-15, the largest iceberg to have formed this season? How common is an iceberg, much less of this magnitude? Less common than fruit flys and more common than an honest man. How long will it take for Antarctica to replace this much ice? The loss is irreperable, the penguins have gone into mourning. In terms of size is this one unusual? How normal is this? Three arctic outposts have been abandoned, the scientists fearing the worst. In the outlook of millenia this is a normal occurence. When it comes to the pettyness of humankind, it looks like judgement day itself. What effects will this iceberg have on the climate of North America? How soon will the effects begin? This will compound the effects of global warming, creating erratic seasonal patterns, rain in the summer time, tornadoes across the greater midwest and possibly a tsunami if contact occurs. How will this affect the world? Actually, there will be, certainly for now, no serious world-wide consequences. Just kidding. What kind of danger does this pose? I know, of course, shipping lanes, but what else? Shipping lanes are linked to the international distribution of goods. Chaos theory makes it possible to predict far-reaching influences resulting from the smallest of distruptions. It's the old flapping of the butterfly's wings metaphor. If shipping stops, people starve, riots start, stock prices crash, the whole deal. We might even be talking revolution. Has there been a significant increase in the number and size of icebergs in recent years? It's been a virtual meteor shower on our coastlines. Where will the iceberg(s) go? I don't know how to answer that question. It makes me, and I feel it safe to speak for my colleagues, sad to think of a homesick chunk of ice somehow. What percentage of ice is above and below sea level? What percentage of the berg was submerged in water before it calved? About 5 to 10 percent is below the sea level, or below the water. I would like to know if there is any land mass? How deep is the ocean there? How thick is the ice? Is the ice sweet water? If so, is this ice formed only from rain fall? And finally, how old is the oldest ice? With regards to any land mass, the iceberg is about the size of Italy. The ocean in that area is on the order of 1500 to 2000 feet. The ice is about 1300 feet below the water, and above the water, it's anyone's guess. It looks like the Loch Ness monster was frozen and is heading due west. As for its age, the oldest ice has traces of wolly mammoth bones according to my colleagues at the University of California Los Angeles, which would make it millions of years old. How deep do you think it goes? We believe that it has a secret tunnel to the center of the earth. How much new water will be added to the oceans of the earth? 900 trillion gallons of water are in this iceberg, beware. The iceberg contains sufficient water to provide 50 inches of water for the agricultural land of the earth or about 5 inches on the land area of the earth. The ocean looks partially frozen above the iceberg, is this correct? You might be on to something. We didn't think it might be freezing the seas themselves. How old is the ice that comprises the iceberg? As before, you can't mark the birthday of an iceberg on man's calendars. Some have been around from the early Paleolithic if not from a time out of mind. Do you think that this iceberg is the biggest one yet? This is close to being the biggest one yet, but one noted in 1956 is probably bigger. Then again, mankind is just a blip on the radar screen of time. What becomes of the icebergs after they break off? After the icebergs break off, they start to move with the tides, the ocean currents, and minor effects from the wind and rotation of the earth. They end up dissolving and slowly raising the sea level. Over time, this action will drown the continents. What will the iceberg do? Will it cause harm? Please direct that question to your local representative. Will ocean levels continue to rise should this type of condition continually occur? Fortunately the effects of global warming may burn off enough water to prevent the oceans from rising. Then again, there will be more rain. If an iceberg of this size crashes into the continental U.S.A., will any destruction occur? What possible consequences can occur with this sole piece of ice breaking off, what could occur should this phenomenon continually occur? Is this a joke? Can we come together to stop this destruction? Is Kentucky immune? Will my cat survive the impact? Two or three of these icebergs and we can all close our bank accounts. This event is not slow in unfolding -- it will take only days or weeks for this iceberg to melt. Will it interfere with shipping? Yes, something of this magnitude could in fact stop the flow of capital. I think that the Spanish Anarchists had a similar effect in the 1930's, although they acheived it through fire, not cold. Well just have to wait and see, won't we? When and if it strikes land is it big enough to jar the earth plates? An earthquake in the magnitude of 10.0 is the minimum we can expect (or hope for depending on your position). 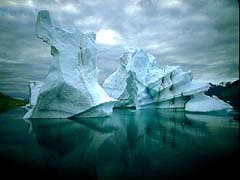 Will this berg have any effect on the Earth's rotation if it doesn't melt in warmer water? Being this large and floating around the seas, could it cause a wobble? It will have enormous effects. Initial studies report that the earth will begin to spin in retrograde for 75 to 100 years and the toilets on each side of the equator will flush in opposite directions. We will send a warning over the radio if there is the need for any serious action, such as hiding in cellars, evacuation, or the like. Stay tuned. Did the sea level rise in New Zealand? Did the sea level rise in Japan? A very small island off the shore of japan was consumed by the rise in sea level. We don't expect this trend to affect any major industrial centers, however. Here in the Great Lakes region our lake levels are down drastically�Does not rainfall come from evaporation of lake waters? Will this affect the rain fall amount? I don't feel qualified to answer this question. please consult this website: http://greatlakes.org for an in-depth analysis. Hypothetically, if this iceberg were to melt overnight what areas would see the most destruction/flooding? Gated communities, mansions, shopping malls and convenience stores. Those with the fire of passion in their hearts will be saved. Will the B-15 iceberg have the same effect as an ice cube in a glass of water; i.e., as it melts it does not affect the level of the water because its volume has already been displaced while in the solid state? Initial reports show that this iceberg does not work like ice cubes in glasses of water. Can we use the icebergs for fresh drinking water? Yes, but I suggest waiting until they melt before trying to drink them. What could we do to relocate it to say, Saudi Arabia? This kind of racist question might better be directed at your president. He can most likely find it in his budget for the war on terrorism, although our nation does get more oil from Saudi Arabia than any other country in the world. Then again, he, just like you, probably doesn't realize that. Could ice be directed toward a gainful destination? By selectively chipping away at it, could the route be affected? Yes, in fact a few men and women, ghostlike in their appearance, have begun this process already. When asked where they were trying to direct it, they answered, "straight into the core of the sun." We didn't ask for further explanation. Would animals on the iceberg drown at sea when the ice melts or go so far from their food source that they starve? If there were any animals left on the face of the earth, yes they would most likely drown. How fast is the iceberg moving? If it were moving through empty space without any air resistance, it would be travelling at over 400 m.p.h. Does anybody keep track of size and movement of icebergs? We haven't got the budget approved for that yet. What caused the iceberg to break off? We hypothesize that there were objective conditions in the structure of society that had a grave affect on the earth's techtonic plates. An eruption, an earthquake, or some subterran rumbling sent it flying. What sort of environmental implications does this have? Be glad that all the water in the world does not collect on Antarctica. With regards to your final questions/comments, the best I can offer is that the research community would like to research this iceberg to learn more. Funding for worthwhile research is always needed. Just one more question: What kind of weather in the next 50 years will occur in NORTHEASTERN,OHIO in the US? The stars will rain blood and the locusts will dominate the fields. How do you monitor the icebergs from Idaho? There are no know icebergs in the state of Idaho, besides the governor. Last one, I promise: Who discovered the icebergs? How? 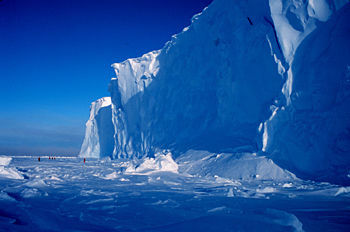 A few unsettled creatures, at home nowhere, dissatisfied with their existence sailed to the Arctic 10,000 years B.C.E. to begin a community of free human beings. The experiment worked for some time, they loved and labored freely, surviving off of penguin meat and fish. They had neither philosophy nor literature. Life itself sufficed so there was no need for abstraction. Yes but, what satellites do you use and why? They are all expensive and fascinating. They are like little planets orbiting our earth. Why does changing my browser size make the images on the right blend in with these questions and answers? I wanted to simulate the frightening nearness of the iceberg at all times. Imagine the physical reality of the ice block as the images and our daily lives, our conversations, and absurd habits as the text. When the distance between the two becomes less distant (as the browser size decreases) a blurring occurs, words cease to make sense, we face a vertiginous plunge into non-meaning. What�s the value of satellite imagery in observing the iceberg? To be honest it is nearly worthless. It is much better to see them from the shore line, where they glide through the water like vast white wales. Will we be able to watch this iceberg float away? We do plan to follow the iceberg, risking life and limb in the process. We are Captain Ahabs tracking the unknowable. 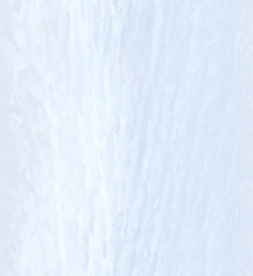 Why do some of the iceberg pictures sometimes look upside down? And sometimes backwards? It depends on how you hold them. Why do the geographical lines jump around from image to image? Why is the iceberg south of -78 in the 16:38UTC image, at -78 in the 9:19UTC image, and south -78 again in the 09:49 image? Why does the navigation (map outline) look rock steady, while the surface features don't? It's all smoke and mirrors -- as is most science. We just thought the images looked better this way. There's no iceberg, just your fear of it. How was the iceberg discovered? What does it mean for people like me? We were alerted to this iceberg by colleagues at the University of Florida who are studying iceberg motions with us. They informed us and we called them liars for the first few days. Later we believed in it against our better judgement Then suddenly one day, we realized that this might be the very thing that disrupts the course of the world as we know it. The oceans might flood, earthquakes might be in store. Naturally we were scared. But then we just sort of all "changed the channel" so to speak, altered our brainwaves and blocked it out. No one is going to do anything about it, and we are all certainly too lazy and tired. Try spending three straight winters in the Arctic. We realized the ice berg would be used for building a theme park, and the people who were trying to guide it to the center of the sun were just as crazy as we were. So we're not scared of it anymore. It may have the power to destroy worlds, but certainly not ours. It might crash into the Soviet Union or Greenland or some third world country, but certainly not our country. And everyone knows there's no way to direct an iceberg. Not even by chipping it off one block at a time. The Antarctic environment is highly susceptible to the impacts of human activities, and as a general rule has much less natural ability to recover from disturbance than the Australian environment; consider this when undertaking activities in the field. The collection and coordination of relevant information facilitates effective environmental management, science and support operations. To assist in this process, accurately record the custodian, location (preferably by GPS) and usage details of all field activities (such as sample sites, field camps, depots, oil spills, markers, equipment etc.) for transfer to a management database. All supplies and equipment taken into the field must be removed, except where a permit provides otherwise. The collection or disturbance of any biological or geological specimen or man-made artefact may only be undertaken with prior approval and, if required, in accordance with a permit. Some biological communities and geological formations are especially fragile, even when concealed by snow; be alert and avoid such features when travelling to and between field locations. Vehicle and helicopter usage should be restricted to essential tasks to minimise: atmospheric emissions; track formation, physical disturbance of the land surface or biological communities; wildlife disturbance; and the potential for fuel spills. When vehicle use is essential, access should be restricted to areas with permanent ice/snow cover (> 30 cm to provide adequate protection of underlying features) and designated ice-free routes. Fuel spills are difficult to clean up, and take many years to dissipate. Vehicles and other equipment should be fully fuelled on station before departure, to reduce the need for refuelling in the field. Avoid refuelling or changing oil in windy conditions or in areas that might direct accidental spillage into lakes, vegetation or other sensitive areas. Always use fuel cans with nozzles/funnels and an absorbent spill pad/drip tray. When travelling on foot, use established tracks and designated crossing points wherever possible. Where such tracks do not exist, take the most direct route that avoids vegetated areas and delicate geological formations such as screes, sediments, streambeds and lake margins; these features have taken many thousands of years to form and may also be of major scientific importance. Do not feed the wildlife. When around wildlife be quiet, move slowly, stay low to the ground and adhere to the minimum approach distances (see table following).